I’ve been building extensions for Firefox since 2005. I’ve integrated bookmark services (which got me a job at Mozilla! ), fixed the default theme, enhanced the developer tools, tweaked Github, optimized performance, eased tagging, bookmarked all Etherpads, fixed Pocket and many other terrible wonderful things. I’ve written XUL extensions, Jetpacks, Jetpacks (second kind), SDK add-ons and worked on the core of most of those as well. And now I’ve seen it all: Firefox has the WebExtensions API, a new extension format designed with a goal of browser extensibility without sacrificing performance and security. In Firefox 57, the WebExtensions API will be the only supported extension format. So it’s time to move on. I can no longer frolic in the luxury of the insecure performance footgun APIs that the legacy extension formats allowed. It’s time to migrate the extensions I really just can’t live without. I started with Always Right, one of the most important extensions for my daily browser use. I recorded this migration, complete with hiccups, missteps and compromises. Hopefully this will help you in your extension migration odyssey! Always Right is a simple Firefox extension which opens all new tabs immediately to the right of the current tab, regardless of how the tab is opened. Tab opening behavior is predictable – it behaves the same 100% of the time. The default behavior in Firefox is determined by a number of factors, too complex to list here. Suffice it to say that changing Firefox’s default tab-opening behavior is like chasing hornets in a hurricane. Related tabs are grouped. When I have a thought about something I’m busy doing, and want to start a new search or open a tab related to it, I open a new tab. This addon makes sure that tab is grouped with the current tabs. The default behavior opens that tab at the end of the tab strip, which results in two separate clusters of tabs related to the same task. Conceptually, Always Right is a simple extension but ultimately required a complete rewrite in order to migrate to the new WebExtensions API format. The majority of the rewrite was painless and fast, but as is our bane as developers, the last few bits took the most time and were terribly frustrating. The overall concept hasn’t changed: An extension built with the new APIs is still a zip file containing a manifest and all your code and asset files, just like every other extension format before it. Renaming and migrating to the new manifest format. Rewrite the code to use the new WebExtensions APIs. Use the new web-ext CLI tool for packaging. The first step is to migrate your manifest file, beginning by renaming package.json to manifest.json. The most important change is to add the property manifest_version and give it a value of 2. With the manifest_version, name and version fields in place, you now have all the required properties for a valid extension. Everything else is optional. However, since you’re updating an extension that already exists, you need to do a couple of other things. The id property is necessary in order for addons.mozilla.org (AMO) to match the new add-on with the old one. Remove the top-level id field, and copy its value into the applications/gecko/id field. If you used the main property, you’ll now specify your entry point file by the specific functionality, such as background scripts, content_scripts, browser_actions (toolbar buttons), page_actions and options_ui. In my extension, I need to listen to tab events, so I used the background property to load a script. The permissions property is used, but differently. The value is now an array instead of an object, and any values you had are likely not supported anymore, and will need to be replaced. You can read about the supported permissions keys and values on the manifest.json permissions page on MDN. There are more optional fields not covered here. 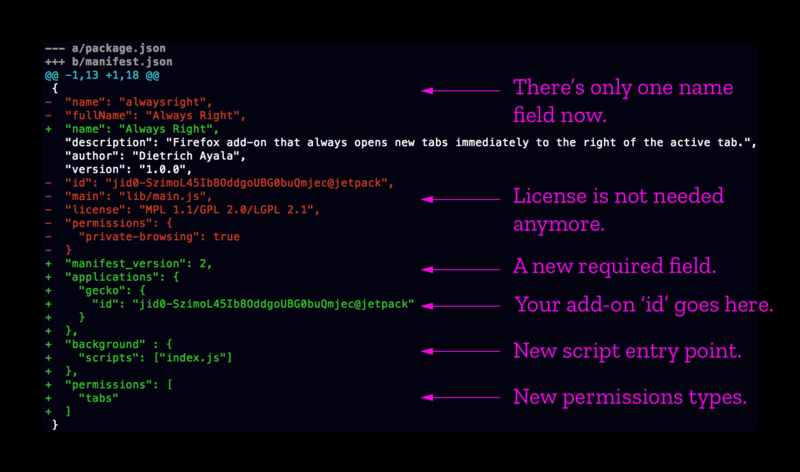 Read about the other fields in the new manifest.json docs, and for reference here are the old package.json docs. The flow of Always Right is that it listens to an event that specifies that a new tab has been opened, and then modifies the index of that tab such that it is immediately to the right of the currently active tab. I first moved my /lib/main.js file to /index.js and specified it as a background script in the manifest.json file as noted above. I then migrated the code in /index.js from the old SDK tabs API to the WebExtensions tabs API. The old SDK code used the tabs.open event and the new code uses the WebExtensions tabs.onCreated event. A more interesting conversion was how to get access to the currently active tab. The WebExtensions API code initializes before the active tab is retrievable, so I needed to add checks for the active tab and no-op if it wasn’t available yet. The SDK tabs API didn’t fire when the user reopened a previously-closed tab, but the WebExtensions API does. So I had to add checks to make sure that I didn’t relocate these tabs. Another behavior change is that placing a tab adjacent to a pinned tab that’s not the last pinned tab puts it at the end of the tab strip, instead of just putting it at the end of the pinned tabs, like the SDK API did. So now I get all tabs and iterate over them until I find the last pinned tab, and place the tab there manually. The WebExtensions API executes tabs.onCreated listeners after the tab is added to the tab strip. This means that with Always Right, if you have a lot of tabs (say, hundreds), you can actually see the tab added to the far end of the tabstrip and then whiz back over to the right of the active tab. It’s dizzying. Compounding the problem above, the tab strip scrolls to the new tab, so the currently active tab is scrolled out of view. The new, improved developer workflow for testing in an existing profile is entirely different from the Firefox SDK. To install your add-on for testing, open a new tab navigate to about:debugging (see screenshot below). Click the Load Temporary Add-on button and select any file from your extension’s source directory. Your extension will be installed! But what if you see an error there? What if the functionality is not working as expected? You can debug your extension using the Browser Toolbox. Read here how to configure and open the toolbox. Later in the development process I found the web-ext CLI which is great. Use web-ext run like you would cfx/jpm. It opens in a temporary profile. Once my changes were finished and tested, I relied on my new-found friend web-ext and bundled a zip file with web-ext build. The zip file is found in the web-ext-artifacts subdirectory, named with the new version number. I uploaded the file the same as always on addons.mozilla.org, and the extension passed validation. I waited less than a day and my extension was reviewed and live! I’ve fixed most of the reported issues, so my users and I can now ride happily off into the sunset together. Looking for help? There’s detailed documentation on migrating your add-ons on MDN, check out the legacy extension porting page. You can see the source code to this add-on in the Always Right repo on Github. If you see any more bugs, let me know! And if you’d like to try the extension out, you can install Always Right from addons.mozilla.org. All code is a work in progress, and participating in the development process by reporting bugs is the easiest way to get things fixed. If you encounter bugs in the WebExtensions APIs, file them in the WebExtensions components in Bugzilla. No easy way to test extension behavior across restarts, because I found bugs that only occured on Firefox startup, but development extensions are uninstalled at restart. Tabs.onCreated and onRemoved are evaluated at different times – I found this issue while trying to figure out how many tabs it took to be able to make things slow enough to visually see new tabs being relocated in the tabstrip. My Tabcount add-on is here. Tabs.onCreated evaluation is too late to modify index – this is the bug causing the visual relocation of tabs from the end of the tabstrip to the new location. Need a way to know whether a new tab is just a previously closed tab being restored – this bug would really help any extensions doing things around where and how new tabs are opened. Moving a tab to an index that is a pinned tab adds to end of tab strip instead of next valid index – great opportunity for “do what i want” API design. Thanks! I’ll test that change and update the code sample if that’s correct! Yes, it worked! Thanks a lot, I’ve updated the post. I love that from now on all extensions will be created with a single API, but I’m somewhat concerned about what happens to existing extensions. All but one of the extensions I currently use are marked “Legacy”–isn’t Firefox 57 a little too soon for obsoleting old-style extensions? Yeah, for legacy extension authors there will never be a *good* time for obsoleting them. However, because of the security, performance and stability problems those APIs can cause, there’s never a bad time to do it for our users and for the future of Firefox. The add-ons team spent a really long time preparing the community for this migration, and the while it is painful for people like me (loads of legacy extensions), the benefits FAR overwhelm that cost. You should try tree-style tab, it’s a much better way to manage new tabs. “always directly to the right” That’s basically pointless feature. It’s like a guy at the bottom of a well that finally sees someone look in, and just wants a little salt for the frogs he’s been forced to eat. Ask for a ladder, haha! Mmmm tasty salted frogs! I do like tree-style tabs, but for me it solves a different problem. Always Right puts my tabs in context around each other. Tree-style tabs makes it easier for me to visually scan groups of tabs. Can this run on other browsers as well? That was the point of the new (to Firefox) API, wasn’t it? It should be able to run on all the browsers that support the Tabs API. For me, cross-browser compatibility is not *the* point of adopting the WebExtensions API. I’m a Firefox user, and I’ve always developed Firefox extensions primarily to scratch my own itch… and if others like the extensions too, that’s great. I’ve never shipped an extension for any other browser because I don’t use those other browsers except for testing web content or to see some new feature (and that’s extremely rare – Browsers are stuck in a tabs tyranny if you ask me). For me as a long-time developer of Firefox add-ons *and* of the Firefox core, I know first hand how *bad* the legacy extension situation really was. It was a security, stability and performance nightmare that would never end for as long as that architecture was still in use. Honestly. So bad. Performance footguns. Security sarlacc pit. Stability like the San Andreas fault.